I was certainly misinformed about the Seminole Indians of Florida. Given the trouble they gave the American army I had thought they were a major tribe with lots of members. Instead I found out they were a number of small bands from a variety of tribes who had gotten together to resist the invading and Americans and successfully fight them to a draw. My first reality check was at the Museum of Florida History in Tallahassee. The Museum had eighteen sections each on a different aspect of Florida’s history and the combination provides a good coverage of the major events in the states history. The first section on the Calusa Indians shows their life style and how they had been killed off by the Spanish and the diseases that they had brought to America. 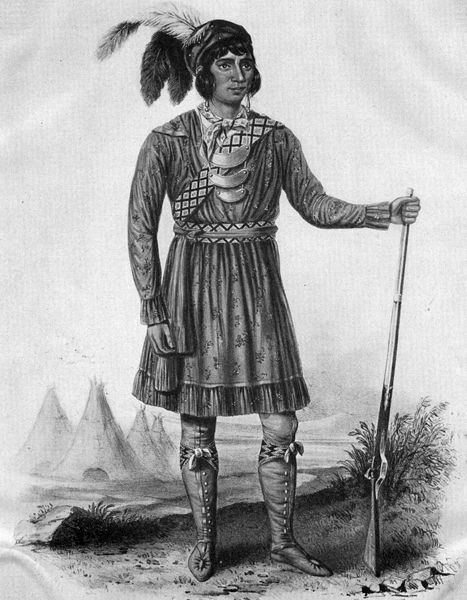 In the early 1700s small bands of Creek Indians began making their way from Georgia and Alabama into Florida. Along the way these Indians joined with escaped slaves and refugees from other tribes to form a new group known as the Seminole. A later section in the museum is given over to Seminole Wars in which the U.S. government attempted to get the Seminoles to move into lands west of the Mississippi River. It emphasizes the leadership skills of Seminole chiefs who led the resistance. In 1832 after the Treaty of Paynes Landing some left, but the others prepared for war. In 1835 the Seminole leader Osceola led a vastly outnumbered resistance of about 1,400 warriors against an American army of 9000 led by Andrew Jackson. The guerrilla tactics Osceola employed had a devastating effect against the U.S. forces. Our army was not equipped to deal with hit and run tactics. We cheated. When Osceola came under a flag of truce to negotiate he was arrested and died in jail a year later. For some reason his body was buried without his head. Other war chiefs took up the battle and continued the war until 1842 at which time many Indians were moved to Creek lands west of the Mississippi. Others, however, retreated into the Everglades and the government gave up trying to conquer or eliminate them and left the fewer than 500 survivors in peace. Estimates are that it cost the government is excess of forty million dollars to fight the Seminoles, a huge amount of money at the time and probably the most expensive Indian war in our history. The U.S. Army hunts for Seminole Indians hiding among the mangroves. 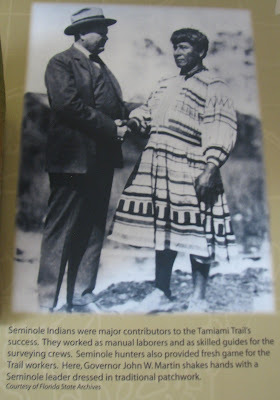 Our next contact with the Seminole story was a week later at an Elderhostel in the Everglades when we were given lectures covering later developments in their history and taken on a tour of the Collier County Museum in the Everglades. 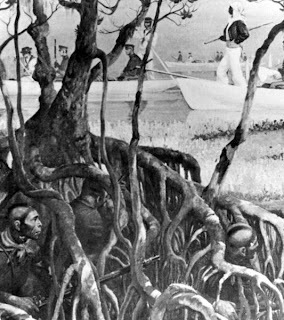 We learned that in 1855 after the third and final Seminole war about 300 Seminoles found refuge in the Everglades. The survivors developed a new culture built on the special features of the Everglades and Deep Cypress Swamp. Farms were built on the mounds the Calusa Indians had left behind. Over time they began to interact with the whites in the area. One of their money makers was to guide plume hunters (bird killers) into areas where there were still large numbers of wading birds whose feathers could be harvested for women’s hats. At the Collier County Museum in the Everglades a small Seminole village has been recreated.
. By the 1920s, the Seminole women began to sell their traditional craft products such as woodcarving, basket weaving, bead working and doll making. Men showed off their traditional skills such as alligator wrestling. Because of the money made from casinos fewer Seminole rely on selling crafts for income. Deaconess Harriet Bedell in 1936 became the savior of the Miccosukee and Seminoles by getting the Brighton Reservation designated. Bedell was very interested in the Indians crafts and made arrangements with the Collier Corporation to sell Indian crafts. The Miccosukee Tribe adopted her and gave her the name Inkoshopie, woman who prays. Picture taken at the Museum of the Everglades that also has a Seminole display. About this time the Seminole cattle industry began which has made good money, and allowed them to expand into other areas. Since the 1930s they have gotten into the sale of duty-free tobacco, resort tourism. In 2006 they bought the Hard Rock Café chain of restaurants. In 1979 Seminoles opened the first casino on Indian land, a practice that has become a multibillion-dollar industry for tribes around the nation. Income from the casinos in recent years funded citrus groves, ecotourism and sugarcane fields. The grounds of the Collier County Museum had some interesting displays. The most interesting to me were two Indian camps. One was a Calusa Indian structure and one a rebuilding of a Seminole Village. They lived in small cypress pole huts called chickees, with palm-thatched roofs and open sides. We also visited the smaller Museum of the Everglades that also has displays on the Seminole Indians. Given time constraints we missed seeing what is probably the most complete museum about the tribe the AH-TAH-THI-KI MUSEUM.